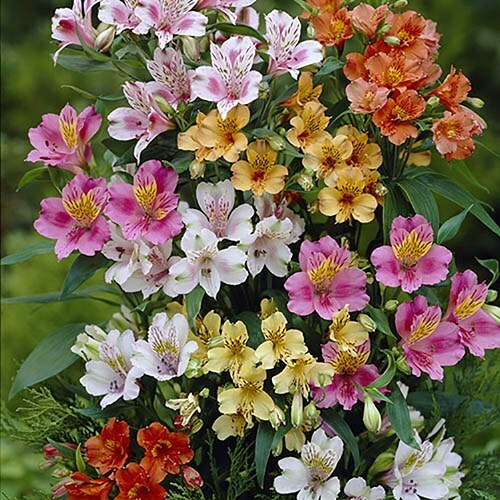 Often seen in expensive bouquets, Alstroemeria also makes spectacular additions to any garden. Flowering from early June onwards, theyll go on right through until early Autumn for many years. Often called Princess Lilies, Peruvian or Inca Lilies, Alstromeria's stunning displays make it one of the most popular summer flowering perennials of all time. Often seen in expensive bouquets, Alstroemeria also make spectacular additions to any garden. Their gorgeous, delicate blooms come in one of the widest and brightest ranges of colours imaginable. Flowering from early June onwards, Alstroemeria will go on right through until early Autumn and just get better and better every year. Once planted, these bare-root beauties will quickly establish and go on to produce strong stems that will grow up to 2-3ft tall this year. Completely covered in flowers along their top half, Alstroemeria are perfect for cutting and creating the most stunning indoor display. Supplied as 10 bare root sections, simply plant them in a sunny and well-drained spot for best results. Fully winter hardy.